I recently made a stone top table with Mortise and Tenon Joinery. I was thinking of making more of these tables, also ~3×3” legs with 1.5” thick aprons would make some pretty sweet work tables out of construction grade pine. 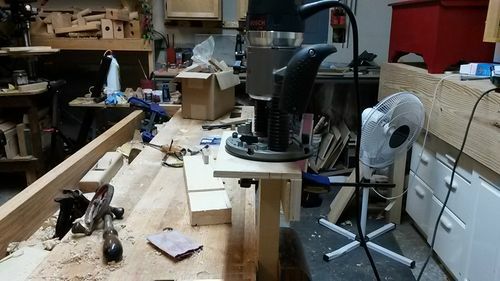 Normally I would simply use a router and edge guide to make the mortise, then cut the tenons with a combination of hand tools (to cut shoulders) and bandsaw for the cheeks, then cleaned up with a router plane. However since I want to make multiple tables I figured a lose tenon jig to speed up the process was worth the investment in time. I wanted something simple, most of the plans out there have complicated adjustable stops and hold downs. But the simple jigs I’ve seen out there, like the one below, don’t allow for adjustment to add a 3/16” reveal which gives you that nice shadow line where the legs and aprons meet. So I came up with this simple solution! The jig places the mortise in the desired location on the leg. Then a 3/16” spacer is added to center the mortise on the 1.5” apron piece. The slot in the plywood guide is ¾” for the bushing to ride in. A ½” spiral bit fits through it to make the mortise. The spacer is simply a piece of 1/4” plywood (actually 3/16”). Hopefully the below pictures make it clear what I’m talking about. If you look closely you can see the plywood spacer in this first picture where I’m cutting the mortise in the apron piece. Just one quick grip clamp secures the whole thing, very easy to set up. 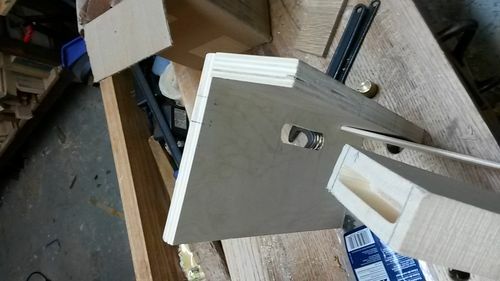 The mortise on the Leg (test piece here) is just clamped in the vise all together, the leg with the jig, no spacer, very simple. 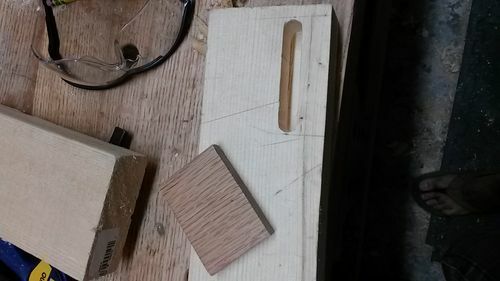 A scrap piece of 1/2” oak is used for the tenon. I just knock the corners of it off with a block plane. This jig is super easy to make once you get over making the first one. 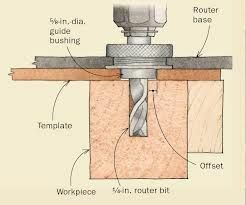 All you need is a 3/4” router bit that matches he OD of the bushing. To get the placement of the guide groove don’t get into the complicated math (what I did at first, and got it wrong, I cant add fractions). Just lay out the mortise on the apron. Place it under the jig with the spacer and transfer the lines on to the plywood. Add 1/8” on each side of your 1/2” marks to = 3/4” and rout out that groove. I used the router table but next time it will be so much easier using an edge guide on the hand held router. THIS JIG CUTS THE TWO MORTICES WICKED FAST! I WILL DEFFENTILY BE MAKING MORE OF THESE IN STANDARD SIZES. My mortices are only 1 1/6” deep. 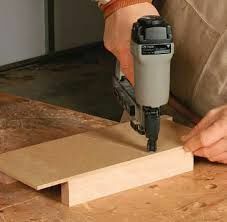 I want them to be deeper so I may make another jig with 1/4” plywood instead of 1/2”. Hope this made sense, I barely have time to post blogs anymore so this is a little rushed. Shoot me questions if you have any. Here are a couple of more pictures I found. Just shows how simple they are to make. Mauricio, I like simple and you captured it with this jig. Nice work!! 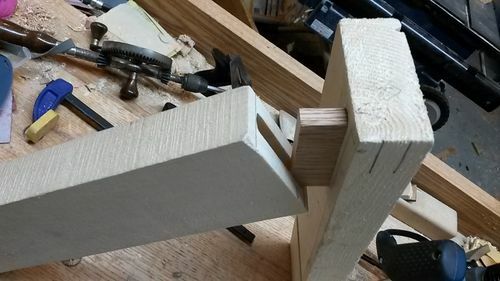 I still have yet to make mortises with a router…..but that’s how I was thinking about doing it. Thanks. Red, i’d be interested to hear what you think and how you like it vs. your current method of mortising machine and dado stack. Cool. That’s the one of the moments when I feel bad I have no room for power tools in my shop.